So I was living in Flagstaff, Arizona and dating my neighbor (embarrassed, and won’t say his name so HE isn’t embarrassed – we are still friends). He had an ex-girlfriend who was an artist named Betsy. Betsy did a chalk drawing of this formation that just blew me away. So for months I searched the Chinle’ area of Arizona looking for this formation so I could give it my own twist with oils. Finally one day there it was, in all it’s glory. I never stopped thinking of it as Betsy’s formation, so I decided to honor her talent by naming the painting after her. She married someone else and had a baby, but I don’t think she continued to do artwork unfortunately. Well, she inspired me, as did this beautiful part of Arizona. 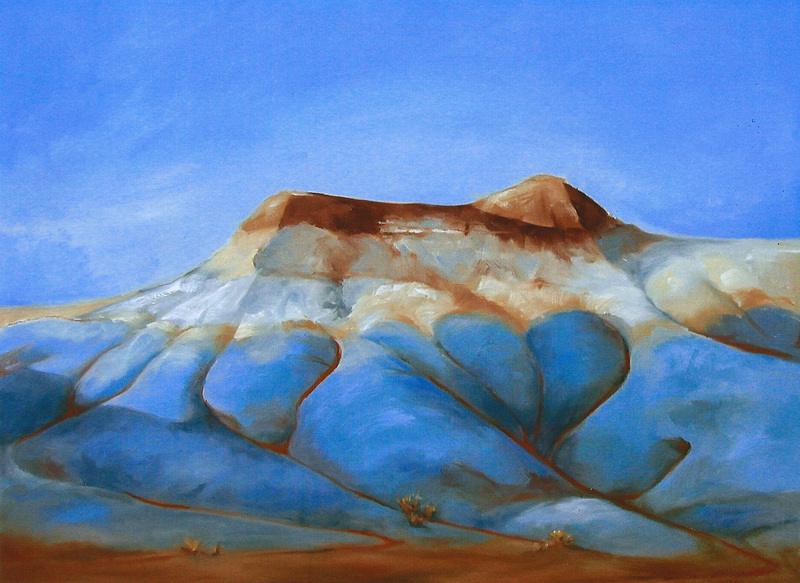 It’s called the painted desert (apply named) and is so beautiful I created 25 paintings. I had to move from Arizona to Maryland and took the whole collection with me, having only showed it once in a small local gallery, and displayed one piece (and sold that one) in a well known gallery in Sedona Arizona. One day I hope to show the whole collection for the viewers to experience the beauty of that part of the desert.